Parents who disagree with the content in a television program aimed at children can use this T.V. complaint letter. 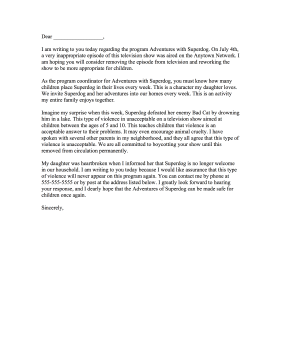 I am writing to you today regarding the program Adventures with Superdog. On July 4th, a very inappropriate episode of this television show was aired on the Anytown Network. I am hoping you will consider removing the episode from television and reworking the show to be more appropriate for children. As the program coordinator for Adventures with Superdog, you must know how many children place Superdog in their lives every week. This is a character my daughter loves. We invite Superdog and her adventures into our homes every week. This is an activity my entire family enjoys together. Imagine my surprise when this week, Superdog defeated her enemy Bad Cat by drowning him in a lake. This type of violence in unacceptable on a television show aimed at children between the ages of 5 and 10. This teaches children that violence is an acceptable answer to their problems. It may even encourage animal cruelty. I have spoken with several other parents in my neighborhood, and they all agree that this type of violence is unacceptable. We are all committed to boycotting your show until this removed from circulation permanently. My daughter was heartbroken when I informed her that Superdog is no longer welcome in our household. I am writing to you today because I would like assurance that this type of violence will never appear on this program again. You can contact me by phone at 555-555-5555 or by post at the address listed below. I greatly look forward to hearing your response, and I dearly hope that the Adventures of Superdog can be made safe for children once again.